In December 1922, Ernest Hemingway was in Switzerland, on assignment as a correspondent for the Toronto Daily Star, covering the Lausanne Peace Conference. The journalist and editor Lincoln Steffens, whom Hemingway had met in Genoa, was also there. Apparently, Steffens was impressed with Hemingway’s writing and asked to see more. 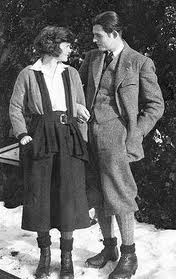 Hemingway’s wife, Elizabeth Hadley Richardson, always known as Hadley, was in Paris, where they were living at the time. She packed up all of Hemingway’s papers in a suitcase, to take them to him in Switzerland. She packed everything she could find. While the train was still standing in the Gare de Lyon, Hadley went to buy a bottle of Evian water for the trip. She left the suitcase unattended on the train while she did so. When she came back, it was gone. At that point, nothing of Hemingway’s fiction had been published. In Paris, there was nothing left. With touching thoroughness, Hadley had packed both the originals and their carbons. Only two short stories survived the disaster. “Up in Michigan”, which he had buried in a drawer because Gertrude Stein had said it was unpublishable, while “My Old Man” was out with an editor at a magazine. But maybe he did reach that mood. “The first and most important thing of all, for writers today,” Hemingway later said, “is to strip language clean, to lay it bare down to the bone.” Juvenilia (or Juvenalia in Hemingway’s misspelling) are often just that – rambling, unstructured, wayward pieces of adolescent hopes and dreams. Which of us would gladly publish our teenage love poetry? Hemingway had his language stripped clean all right. Indeed, with the loss of the manuscripts, and with time pressing to replace those vanished words in his bid to become a respected writer, Hemingway may have adopted and adapted the lean prose style for which he became famous. Hemingway never bothered to run a newspaper advertisement seeking the return of the manuscripts. When he considered one, he thought of offering a reward of 150 francs. About ten dollars. Grace under pressure? Or a sign that the manuscripts were not so valuable? They would be valuable today, of course. If they survived. If they ever turned up. What did the thief do, on realising that the stolen suitcase contained paper, worthless paper with the juvenile scribblings of an unknown writer? No gold, no diamonds, no lucrative passports to be traded on the black market. Throw them in the Seine? Burn them? Bury them in an attic? Of course, if they do turn up in an attic, these lost manuscripts of a Nobel prize-winning author, they will be worth more than their weight in gold. This entry was posted in Stolen manuscripts and tagged Hemingway on 31 July, 2010 by Horatia. i have the manuscripts. i’m in switzerland. will sell them in 2016 for a billion dollars. It’s 2016. I got the cash. Meet you halfway? Haha!